Set along 30 acres of shoreline and cradled by Georgia pines, our lakeside resort is a place of peace, exploration and connection. Away from the buzz of the city, our lakeside resort offers a beautiful alternative to the traditional meeting venue. Pairing modern facilities with attentive service, we can host board meetings, product launches, corporate retreats, company-wide celebrations and other business functions. A rose petal-strewn path leading to a lakeside lawn. The shimmering glow of fireflies amid the forest. The flicker of candlelight in an elegant ballroom. The rustic charm of an 1820s barn. 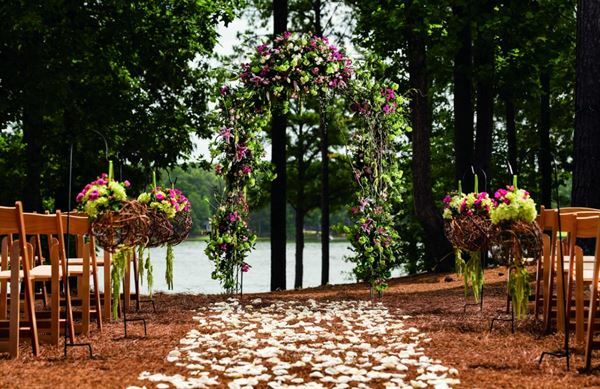 From charming outdoor weddings to traditional indoor celebrations, our Lake Oconee resort is the ideal venue for your special day. We take a simple approach to weddings, combining the natural beauty of our surroundings and the expertise of our planners, event staff and culinary team. Every detail, from your personalized wedding menu to the artfully arranged table settings, is crafted with an eye for perfection. Settled along the sparkling shores of Lake Oconee, this lawn space is perfect for intimate ceremonies and receptions of up to 200 guests. Overlooking the lake and surrounded by trees, the Forest offers a casual, romantic venue for an outdoor celebration with stacked-stone fire pits and the ability to host up to 300 people. Overlooking the lake, this outdoor venue offers a pergola and a sprawling lawn that can accommodate up to 600 guests for a standing reception or 400 for a seated banquet. Say “I Do” under The Pergola, on The Landing. It provides a breathtaking backdrop for catered parties and events accommodating up to 400 guests. Our largest indoor venue, this ballroom can accommodate up to 600 guests and includes a generous pre-function area that opens to an outdoor balcony. The Grand Ballroom offers 7,200 square feet of space to guests and accommodates up to 550. Complemented by a generous pre-function/foyer area, that opens to an outdoor balcony, the perfect venue for cocktail hour. Located in the Oconee Clubhouse and overlooking the luscious greens of The Oconee Golf Course, this ballroom can accommodate a standing reception for 250 people or a seated banquet for 150. World-class amenities abound at Reynolds Plantation. The Lake Club Wellness Campus has become the nexus of social activity. This member-only club offers an indoor and two outdoor pools, an award-winning tennis center, fitness center and more, along with a beautiful location overlooking Lake Oconee. Six golf courses complement a range of outdoor activities along more than 374 miles of shoreline. And four marinas, four clubhouses, six world-class restaurants serving casual to elegant fare, 16 tennis courts, miles of walking trails and beautiful natural scenery combine to make Reynolds Plantation the perfect place for a weekend getaway, meeting or wedding. I have been to Reynolds Plantation twice for meetings and customer/client golf weekends and it is everything that it says it is in their promotional material. You will be totally pampered from your arrival until departure. Excellent, 5 stars!! The American Legion Post 233 is Loganville area's premier rental hall. The facility was completely renovated in September 2014. With neutral colors, an open floor plan and plenty of space, it is perfect for weddings, reunions, corporate meetings, etc. The venue offers a catering kitchen for your caterer to prepare your dishes. The rental hall and parking lot can accommodate 250+ guests (300 without a dance floor). Travel Weddings and Events serves the Winder, GA area with our One-Stop Shop venue space and destination wedding services. At our venue, we make it easier for our clients to plan every detail of their special occasion at one location. We provide you with a beautiful event space, plus everything you need to make your event a success: chair covers, sashes, table linens, napkins, center pieces, backdrops, silverware, plates, and water and champagne glasses. What sets us apart is that we also arrange honeymoon packages, hotel rooms, rental transportation, cruises, airline tickets, and vacation packages for you and your loved ones. Perfect for weddings, birthday parties, anniversary parties, conventions, and bridal/baby showers. We also provide services for your dream destination wedding. There is no need to go from vendor to vendor, because we have everything here for you. We pride ourselves on our unmatched customer service.